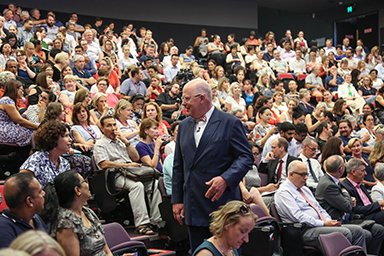 It was a full house across major University venues ­– including Macquarie and Price Theatres – as more than 1000 staff gathered to hear from the Vice-Chancellor Professor S Bruce Dowton at an all-staff Town Hall last Tuesday. The Vice-Chancellor and the Executive Group will hold Town Halls at particular points throughout the year to keep the Macquarie University community up to date on important information for the University. 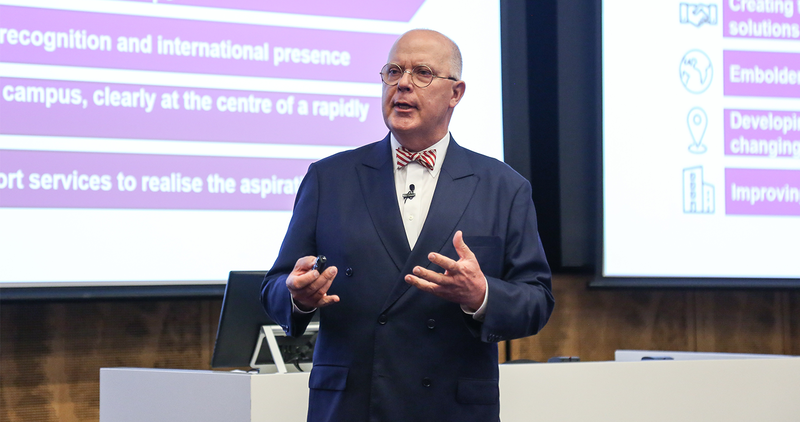 In addition to sharing progress against our strategic priorities ­–­­ as outlined in Our University: A Framing of Futures – the Town Halls provide an opportunity to acknowledge the extraordinary contributions we all make as Macquarie staff to achieving this success. Here’s a quick summary of what the Vice-Chancellor had to say. If you’d like to watch the full presentation, a video link will be available in the coming days. Student numbers are healthy, with international student recruitment targets exceeded for 2019 and domestic numbers close to the target. Research income is increasing. The number of MRes students going on to complete a PhD is also on the rise, which the Vice-Chancellor described as an ‘unmitigated success’. The Vice-Chancellor urged staff to welcome and assist, wherever possible, new students embarking on their education journey at Macquarie. Every single student that comes to our University should experience a ‘transformative education’. He highlighted the impact of rankings and encouraged academic staff to register for an ORCID number to appear in published papers, so they are properly credited for their work and their link to Macquarie University. The Vice-Chancellor updated staff on the curriculum transformation project and explained the process behind refining unit offerings. He noted that 100 units had been identified to date to be discontinued in 2020. The Vice-Chancellor highlighted the upcoming launch of Venture Café – part of the Macquarie Park Innovation District success story. He flagged the current development of a new internal communication strategy to improve information sharing across the University. Could you please let us know when the video is available? Is the video of this meeting going to be available? Hi Debbie, yes we’re told the video is on its way, and we’ll let you know when it’s available.